We have specialized in aviation training manuals for over 13 years. 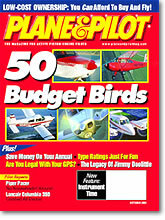 Sold over 15,000 manuals and helped numerous students pass their FAA practical test. Are you ready to impress your instructor on your next lesson? Want to know everything there is to execute a maneuver thoroughly? Want to save $$$$$ in your training costs? Then we have a manual for you! your instructor reduced. All this means less dual instruction time which is not cheap! visualize the maneuver.You will not find a more thorough book out there! And when it comes to safety, thorough is a requirement! How are our manuals better than our competitors? clip board in the cockpit. Thorough - You will not find a more detailed maneuvers manual out there. Rules of Thumb - Gives you general rules of thumb and formulas needed for that maneuver. Aircraft Table - Gives you the parameters using a C172 or PA-44 for completing that maneuver. Also allows you to put in the parameters for up to 3 more aircraft. Completion Standards - Gives you exactly what the FAA is looking for in order to pass. where the information came from and on what pages. Multi Engine Pilot Flight Maneuvers - Only book of its kind. Aero Tech is leading the industry with the first multi engine flight maneuvers manual.